Dad came home one day and told Mum that they wanted a boy for 10/- a week to work between 7.30 and 7 - 8 pm. to clean shoes, cutlery, outside windows, scrub out two bars twice a week, take people's luggage to either Western or Southern stations and chop a certain amount of firewood. I did this and more for about six months until I got a whitlow on my finger so I got the sack. Then Dad heard that there was a job going at Mr. Stillwell's stable at Clewer near Windsor race course. I got the job because I liked the horses. I was looking after a hunter, polo ponies, hacks, one stallion and one two-year-old racehorse which was being trained for racing. I must say a few words about Captain Vivien the two-year-old. The 'Guy' and I used to go on Windsor racecourse knocking a white polo ball about which I enjoyed. I asked the reason for it. He said, " To get the horses to learn to change legs as polo ponies have to do. " So I watched and they did, so there was no need for them to cross their forelegs in a race which would bring them down. I think being in the stables, the smell got into my blood and fetched me out in boils. At this time I had two on my neck and one on each cheek of my behind. I could not sit down but I did not tell the 'Guv' about it because I was managing very well until he said, "Saddle up the 'Cap. ' and we will have a knockabout." We saddled up and went to the course. The horse was a lot taller than the polo ponies so I had to reach down further and as I did both boils on my behind burst and it all ran down my legs, but what wonderful relief Funny thing is that I have not had a single boil since. I was receiving 18/- a week for working from 7.30 am. to 7.30, or to 9.00 pm. when the 'Guv' went to the sales in London just in case he brought one or two home with him. They were mostly army horses. Another chap came to work with me. His name was Bert Horton. His father was head coachman at the Queen's stables at Frogmoor in the Great Park which is where the Windsor Greys were born, bred and trained for the Royal Coaches. For three years I didn't have a shirt to my back. Mostly I wore an old jacket. Then Bert Horton asked me if I would like an old chauffeur's suit including leather gaiters. It lasted me for two years until I left the stables. We exercised our horses in the Great Park and always went along The Long Walk. On this particular day, a coach and horses came along the Walk to the Castle gates. My mate's horse bolted down the Old Windsor Road and when Bert came back he said it was my Dad. I said that I didn't notice because I had to keep my horse from following you. The horse was four years old and had never been broken to harness of any sort. The following morning Mr. Stillwell wanted to know what happened in the Park. I told him that it was the two-year-old which B. Horton was riding which bolted. So I was the only one to ride the two-year-old after that. One day my mate's father came to see Mr. Stillwell and they both came to see me in the yard. Mr. Horton asked me if I would like to work at Frogmore. I had to refuse because I was the only one in our house bringing in money added to which I would have a six mile ride morning and evening which I did not relish. He told me that he liked the way I rode horses and there was a job waiting for me if I wanted one. 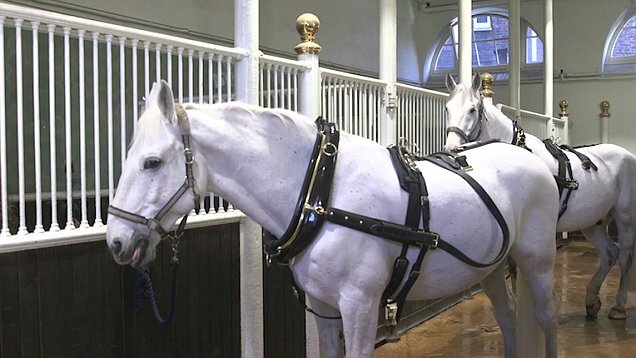 The horses trained at Frogmore were the ones used to pull the Royal coaches. Just after this happened the 'Guv' went to London for more horses. He told us to exercise the same two horses. When going through the park we came to a hedge about two feet high so we decided to jump it but my horse blundered and fell over it. Of course, he had to fall on me, across my right leg. Instead of waiting for him to get up I tried to pull my leg from under him and I twisted my knee which swelled up like a balloon. I managed to ride to the stable and the Boss had to take me home in the buckboard. After I had been home a few days there was a knock at the door. It was Mr. Stillwell, my boss. He wanted me to go to the stable and catch a horse for him as they had been trying for hours. He was loose in the paddock at the back of the stables and nobody could catch him. The horse was a famous trotter. He had won five firsts, seven seconds and three thirds at the Olympia Horse Show in London. He had a small thick body and short fat legs. His feet were as big as small plates and his head was very nearly as big as his body. When he was trotting his feet came up to his ears and he was a picture to watch. As we went out of the door I noticed a crust of bread on the table which I picked up and put in my pocket. The horse's name was Lonsdale. I always called him 'Lonny'. So when we got to the paddock the boss sent one of the chaps for some oats and bran in a sieve. I told him that I did not want it. Lonny was on the far side of the paddock. I called him, "Come on Lonny." He pricked up his ears and came trotting towards us. He stopped by the gate so I offered him a piece of bread crust and while he was chewing it I slipped the halter on him. I think that the Guy was a bit surprised. They had been trying to catch him all morning. The Guv didn't say a word until I got home. He said to Mum, "I think your boy is a marvel and I shall not turn him out again." I said, "Why not? You only need a piece of stale bread. " There were some army chaps there helping the Guy while I was away. There were three tin trunks in the loft and I had to go and show them what was inside. They were full of silver sand in which was buried bridle bits of all descriptions, snaffle, double snaffle, straight bar and double bar with a cog in the middle (this was to stop the horses putting their tongues out ) and many more. The two Army chaps broke the lock on the other one. It was full of bottles of wine which they took. Of course, I had to have the blame even when I told Mr. Stillwell that it was the other two I had shown it to. So I gave in my notice. I worked the following week, then asked him for a reference. He asked me where I thought I was going to work and I told him, "On the railway." He gave me one.